Tom Neyer was one of Hamilton County's worst Commissioners ever. Neyer is most known for joining with fellow Commissioner Bob Bedinghaus to pass the stadium deals that have bankrupted Hamilton County. Born with every advantage possible, Neyer has squandered all of it and recently filed for Chapter 7 bankruptcy. Neyer's filing revealed assets of $1.4 million with debts of $69 million. In other words, Neyer ran his own finances about as well as he and Bedinghaus ran Hamilton County's. When appointed to be County Commissioner, Neyer was a 30-year-old neophyte with no elected experience, no financial skills, no ability to understand issues, no business skills, and even his work history was limited. So that was the best the Hamilton County Republican Party could find? Somehow I don't buy that. They could have thrown a water balloon into Fountain Square and hit someone more qualified to be County Commissioner. Perhaps in the comments section, someone can explain to me how this incompetent person was the Hamilton County GOP's choice to be appointed Hamilton County Commissioner in 1997. Please name names and point fingers. This region needs to start learning from its mistakes so we can stop repeating them. There are serious consequences to selecting unqualified hacks to fill important positions, and there's a lot of people (especially the current County Commissioners) who need to understand this. Thanks to Neyer and Bedinghaus, Hamilton County is bankrupt today. Bedinghaus and Neyer said we could build two stadiums for $500 million combined, heavily subsidize the Cincinnati Public Schools, build the Banks, build Fort Washington Way, build the Transit Center, give away the store to the Bengals, and reduce property taxes through the Property Tax Rollback, all for a 1/2 cent Sales Tax hike that would expire by 2017 at the latest. In reality the stadium Sales Tax will stay on the books through at least the year 2032. Even worse, in spite of these 35 years of stadium taxes the stadium fund will be running large annual deficits through 2032 which will likely total $700 million or more! This means Hamilton County will have to pass another stadium tax increase, or follow Neyer's example and file Chapter 9 Municipal Bankruptcy which looks like a better option every day. Tom Neyer has managed to bankrupt not just himself, but also an entire urban county. That's quite an accomplishment for one person. This is kind of what I feared was going to happen. Just read the 1st paragraph of the story to get an idea where this is headed. 4) Declare that 67% of the budget is off limits for cuts. So how exactly is the budget going to be balanced? By Abra Cadabra? This is just as silly as building a $200 million streetcar. Memo to the Hamilton County GOP and "conservative" majority on Council - it's your time to be responsible. You can't close a $29 million shortfall by cutting taxes and refusing to make spending cuts. So far, they're not even remotely close to finding the first $29 million of cuts, nevermind paying for the $5 million property tax cut. The city needs to get its finances under control. They've already spent down the reserves over the past decade, as their budgets during that time have otherwise not been balanced. The pension fund likely needs more work. So there's no free money left; it's already been spent. The city simply has to make its income cover its expenses. Is the Mayor or anyone on Council up to the task? The liberal Democratic majorities and liberal Mayors of the last decade have decimated the city's finances and population. Streetcars and the Ministry of Environmental Quality are just two examples of the far left's appetite for wasting taxpayer money. Now that there is a non-liberal majority on Council, they need to make the right decisions to get the city back on track. They're gonna have to do better than this. It's a lot easier to cut $34 million when you play ball in each section of the budget. That includes police and fire, which now comprise over 2/3 of the budget. Finding budget cuts will be much harder if you only look at 33% of it. I imagine the best solution is making cuts to police, making cuts to fire, and eliminating a number of programs from the rest of the budget, along with reforms across the government that have been discussed at length. I hope the non-liberal majority will improve on its lackluster performance so far and run the city's finances far more effectively than the irresponsible liberal majorities have over the past decade. Each year ESPN's The Magazine ranks each sports franchise based on how much they give back to the fans for the amount of time and money invested in them. Out of 122 professional sports franchises, the Cincinnati Bengals ranked dead last. This is no surprise to anyone who has watched how the Bengals conduct themselves on the field, off the field, or with their lackeys on the County Commission. Hamilton County taxpayers have made a massive investment in the Bungles and have nothing to show for it but a mountain of debt and a county on the verge of bankruptcy. We didn't need ESPN to tell us how bad the Bungles are at treating their fans. We know the Bungles are a lousy investment. If the team's clueless fans want to begin each season thinking this is our year, then that's on them, but our county shouldn't invest any more money in them. This year and next year the stadium fund faced deficits of $15 million/year, which was plugged by two Commissioners who broke their word to the voters and repealed most of the Property Tax Rollback that was promised to us. After that it only gets worse, as the annual deficit will rise to $30 million/year. That makes the Property Tax Rollback in serious jeopardy of being eliminated entirely. COAST has advocated time and time again for maintaining the PTR. Our advocacy - and everyone else's - for this principle is needed now more than ever. The citizens of Hamilton County are entitled to the money they were promised from the Stadium Sales Tax increase. And just as importantly, Hamilton County needs to stop investing any more of its limited tax dollars in the worst franchise in North America. In a stunning case of hypocrisy, Council member Cecil Thomas has failed to pay his own property taxes, yet pushes for tax increases on the rest of us at City Hall. 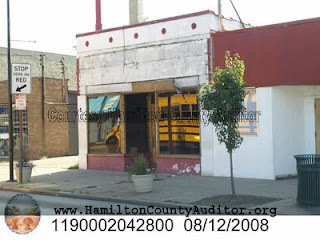 The Hamilton County Auditor's web site shows Council member Thomas and his wife Pamula are the owners of this property located at 4896 Reading Road. Not only is the property poorly maintained, but, according to that web site, Thomas has failed to pay $2,446.36 in taxes owed on the property. The Auditor's site also shows that Thomas is delinquent in his property taxes on properties he owns at 3885 and 3887 Washington Avenue and 515 and 489 Clinton Springs Avenue. Apparently Mr. Thomas believes that payment of his own taxes are entirely optional. Thomas has been a consistent proponent of wasteful spending at City Hall (including the streetcar boondoggle), and Council's most outspoken advocate of increased taxes. He repeatedly has called for an increase in earnings taxes on City residents and workers. Today, City Council votes on whether to raise our property taxes. We have no doubt that Thomas will be one vote in favor of higher property taxes. We would suggest that before Thomas vote to increase taxes on the hard-working families of Cincinnati to pay for his wasteful spending that he and his wife, who both draw taxpayer-funded salaries, first pay their own property taxes. It's just a thought. Our country's fiscal health continues to deteriorate rapidly. Through the first 8 months of the fiscal year the federal government ran a $929 billion deficit, placing our government on pace to roughly match last year's astonishing deficit of $1.3 Trillion. If economists were concerned when our deficit was crossing $400 billion, then 3 consecutive years of deficits over $1 Trillion should have everyone petrified. At some point the rest of the world will stop lending us money. Then what? If people are screaming like petulant babies at the prospect of 5-10% budget cuts in some programs, what happens if the government has to cut 40% of its budget overnight? Social Security - your check is cut 40% immediately. Medicare - 40% benefit cuts. Think the Ryan plan sounds bad now? Military pay - immediate 40% cut. On the bright side revenues are up $139 billion compared to last year. Unfortunately spending has increased $132 billion, resulting in virtually no benefit to our balance sheet. Entitlement programs are driving the spending growth. Social Security is up 3.6%, Medicare $3.8%, and Medicaid 5.4%. Spending on all 3 programs, which already consume a large chunk of federal revenues, is set to explode in the next decade. The modest reforms on the table for these programs should merely be a starting point; the programs are clearly unsustainable in their present forms. The lack of leadership from Barack Obama and most Members of Congress is disconcerting. The childish attitudes of the majority of voters are a problem as well, but perhaps they would be more mature in facing our budget problems if those in charge provided the proper leadership. I'm remaining undecided in the 2012 presidential race until I find a candidate who will credibly tackle these important issues. Now it's Greece. If the United States doesn't get control of its finances, it could soon be us. Imagine ongoing economic depression, much higher taxes, steep Social Security reductions, steep Medicare reductions, significantly reduced government services, severe defense cuts, etc. We need to address our $14 Trillion Debt (and climbing rapidly) before we become Greece. It's not enough to nibble around the edges. It means serious defense cuts, serious Medicare reforms, serious Medicaid reforms, serious Social Security reforms, closing tax loopholes, and scaling back tax deductions, in addition to the reductions in non-security domestic spending we've already seen. Neither party, nor the voters, seem to get it. Democrats think we can control our budget without reforming Social Security and Medicare, and without making domestic cuts. Republicans think we can do it without defense cuts and without bringing in more revenue even by just restricting tax loopholes and deductions. Many voters think we can get our budget under control without doing any of the above. I still plan on doing the Part 3 I had promised weeks ago of my budget series. Soon enough. I planned to do it sooner but then life and stuff got in the way.